San Diego Comic-Con 2014 is coming up fast, and Thinking Ink Press is happy to announce that one of our founders, Nathan Vargas, co-author of the 24 Hour Comic Day Survival Guide, will appear with Nate Gertler, Chris Brady, Jimmy Purcell, and Marco Devanzo on a panel celebrating the 10th anniversary of 24-Hour Comics Day on Friday, July 25 at 5:15 pm in Room 18. Look for Nathan and his co-author Anthony Francis, also of Thinking Ink Press, at Comic-Con. You might even get a sneak peek preview edition of their forthcoming book, the 24 Hour Comic Day Survival Guide. We can neither confirm nor deny the rumor that Thinking Ink Press will be publishing a future edition of this book, or that you might find Nathan and Anthony at the Alternative Press Expo in October if you don’t make it to Comic-Con. What is 24 Hour Comic Day? It’s one crazy day to create an entirely new comic book — a 24 page comic, in 24 consecutive hours. Started by Scott McCloud in 1990 and turned into an annual event by Nat Gertler in 2004, 24HCD is now an institution, with artists participating in their own studios and in venues all around the world. This year is the tenth anniversary of 24HCD, and the event itself will be held October 4th. It’s a fun way to get the help you need to succeed at 24HCD! It’s filled with tips about how to get started, how to keep going, how to keep from getting stuck, how to get unstuck, and how to get to the finish line. Or you can use it just to help brainstorm creating comics! 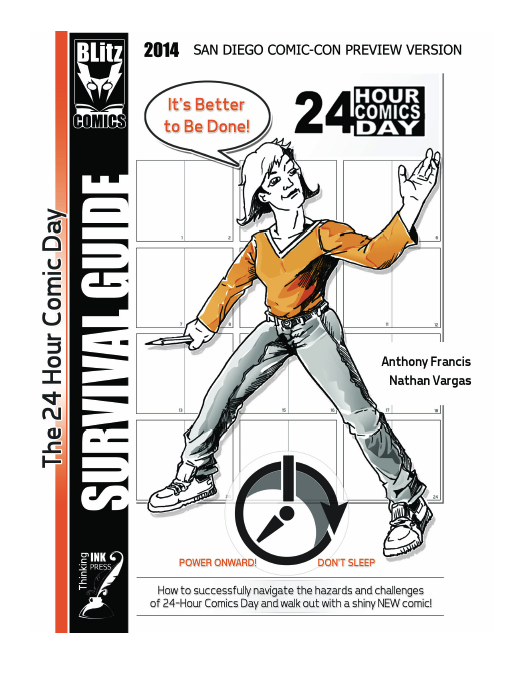 The guide is based on Nathan and Anthony’s experiences participating in 24 Hour Comics Day and hosting Blitz Comics Learning Labs. When is that panel again?